In the blink of an eye, the world of a loved one can change. Life altering injuries can be a challenge to your household routine. If a family member sustained an injury in a car accident or was the victim of medical malpractice, you may need to make home improvements to accommodate that person’s needs. Accidents and medical mistakes can limit your family member’s mobility, cause chronic pain or restrict their ability to personally groom and care for themselves. Because of these issues, your family member may need a wheelchair, walker or other equipment in order to move around. So, to accommodate the equipment your family member needs, it may be necessary for you to make home improvements. 1. Install railings. With railing along the walls and in bathroom showers and tubs, your family member can grab on to something that will help them maintain their balance and feel secure while they are stepping into and out of the shower or getting out of a wheelchair. 2. Walk-in bathtubs and benches. There are specialized bathtubs that accommodate wheelchairs and benches that your family member can sit on in the shower. In this way, your family member can take care of their hygienic needs in private, if they still have the use of their upper body. 3. Flooring. It’s difficult to move medical equipment with wheels across carpeting. Therefore, you will need to install smooth flooring, if you don’t already have it underneath your carpeting, to allow for the mobility of walkers and wheelchairs. 4. Widening entryways and hallways. Equipment with wheels causes dings in the walls or dents on the doors. The average house cannot accommodate large medical equipment with wheels, which is why widening is necessary. 5. Wheelchair ramps. It’s difficult to take a wheelchair up and down the outside steps of a house with someone sitting in it. It’s much easier to use a wheelchair ramp. The home improvements you make will depend on your family member’s disability. You may also have to put in new shelving, lighting, or automated features, such as door openers. Since your family member was injured through no fault of their own, they may need to speak with a personal injury attorney. People who have been injured due to someone else’s negligence may be entitled to receive damages from that person or that person’s insurance company. A personal injury attorney will question your family member about the details of the accident or medical malpractice to determine whether they can file a claim. If so, the attorney would act as your family member’s legal representative and contact the parties responsible for the injuries and negotiate a settlement. If necessary, the attorney would advise your family member of their rights to take the matter to trial. 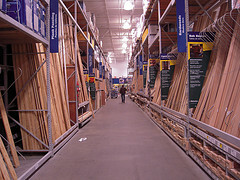 Making home improvements tends to be costly, and most of the expenses are coming out of your pocket. With help from a personal injury attorney, your family member may be able to get the compensation they deserve. Not only will this help your loved one, it will also help you in the long run. Nadine Swayne is a freelance writer who researched disability home improvement for her husband who suffered a stroke. She was able to find information for this article online by searching personal injury attorney and car accident recovery.